The Paigah nobility was founded by Abdul Fateh Khan Tegh Jung while in service to the second Nizam, Salabat Jang. For his dedication and efforts, the Nizam conferred to him the hereditary titles of Shams-ul-Doula, Sahams-ul-Mulk, and Shams-ul-Umara, the latter meaning “the sun among the nobles or masses” and the Paigahs were tasked to take care of the defence and security of the state. The Paigah nobles were very close to the Nizams and the bond was even more strengthened when Abdul Fateh Khan Tegh Jung’s son Fakhruddin Khan was married to the daughter of the second Nizam of Hyderabad in 1797. Since then, Fakhruddin Khan’s descendants married daughters of other Nizams. By protocol, the Paigahs were considered next only to the Nizams. The Paigahs, great patrons of the arts and commanding the respect of the other nobles and the people, extended their unparalleled grace and elegance even to their tombs. The Paigah Tombs are among the wonders of Hyderabad and their marvelous artistry and are shown in their inlaid mosaic tilework. 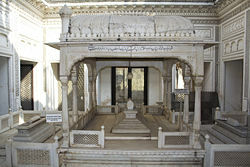 Located at the Pisal Banda suburns in Hyderabad, the Paigah Tombs are delicately carved and enclosed in pierced marble facades. They are regarded as the finest examples of Indo-Islamic architecture, melding both features of the Asaf jah and Rajputani style of architecture. A majestic, double-storeyed gateway structure greets the visitor at the beginning. The mausoleums themselves feature differing designs but all have exemplary craftsmaship, utilizing elaborate canopies and marble fences done in trellis-work that are made up of geometric and floral designs. Arches fringed by smaller semi-circular arches–a feature unique to India–are also employed. Each of the Pagiah noble’s tomb feature something unique different and part of the wonder is discovering each of the difference. All of these are housed by walls that are intricately designed by a wealth of lattice work and exotic designs. It is indeed a wonder it took a long time before these beautiful and awe-inspiring tombs were discovered.